Retaining walls in the landscape fortify and strengthen areas prone to erosion, create dramatic textures in the landscape, build up the soil around pools, and level-out uneven areas. Retaining walls are typically constructed of pre-cast stone, interlocking pavers, rebar-reinforced concrete, or native stone. 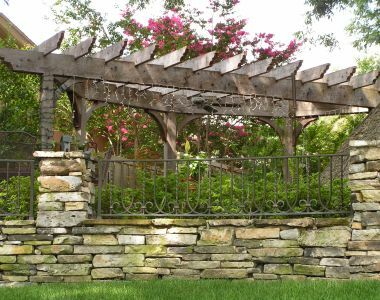 Other applications of stonework in the landscape includes steps, paths, patios, patio extensions, sidewalk overlays, flower bed borders, tree rings, outdoor kitchens, fireplaces, fire pits, and water features, such as swimming pools, waterfalls, ponds, and fountains. Options for stone and rock work are endless. Flat Stones such as Pennsylvania Blue and Oklahoma flagstone are great materials for step, patio, and sidewalk overlays and extensions. Moss boulders, cobblestones, and Mexican Beach pebbles are frequently used as flower bed borders, ground covers, and foundation plantings. 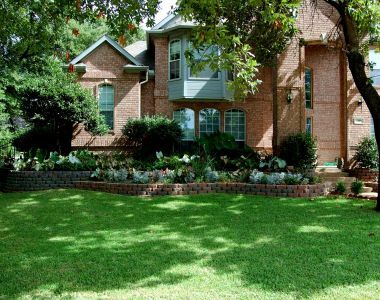 Decomposed granite combined with Oklahoma flagstone creates well-draining, low-maintenance paths and walkways. Pre-cast and natural stone veneers may be used in applications such as outdoor kitchens, fireplaces, patios, and other exterior structures. Remember, due to the structural nature of a retaining wall, consider carefully any contractor hired for this work. Poor retaining wall construction could lead to extensive property damage for you and your neighbors’ homes. Prior to a sizable erosion-related retaining wall construction project, check with your insurance agent to see how retaining walls are covered on your homeowner’s insurance policy. Prior to meeting with any contractor, have a firm budget in mind and make a sketch or craft a list of ideas for your project. Browse YardHookup.com and magazines for ideas and project pricing. For any contractors under consideration, request a project portfolio and verify all references, licenses, and insurance. This is especially important for retaining wall projects. Ensure you understand all aspects of your contract along with any warranties and necessary maintenance.